The bio-morphic shape and clean lines of the Lola coffee table by DeMuro Das were inspired by midcentury design. 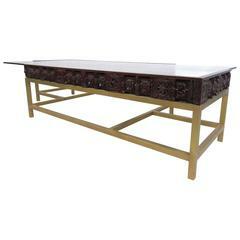 With a stone top made of polished, hand-laid creamy white agate, the table surface is both luxurious and functional. Hand-cast, solid satin brass legs and surround complete the design. Custom sizes are available. Please contact for options. 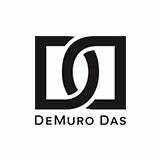 DeMuro Das is a New Delhi based design firm deeply rooted in the vision of its founders, Brian DeMuro and Puru Das. Our furniture collection melds ancient craftsmanship with present-day precision, luxurious materials with simplicity of form, to create a unique brand of modern luxury. Brian and Puru have been at the forefront of furniture and interior design in India since their move from New York to New Delhi in 2002. Their work, which is regularly featured in leading design publications, places them consistently among the Architectural Digest 50 most influential designers in India. With the addition of their US partner, Amy Lee, and the opening of their Brooklyn showroom, the company is now positioned to offer their collection in the US and internationally. The Acantha coffee or cocktail table by DeMuro Das features a Swiss Ebony top laid in a radial pattern. Slender legs in hand-cast solid satin brass support the top. 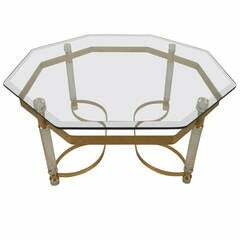 Amazing brass coffee table designed by Sarreid, Ltd.